Nettle, sorrel and dandelion may be considered as weeds in most parts of the world, but in Latvia all these plants are part of a diet. 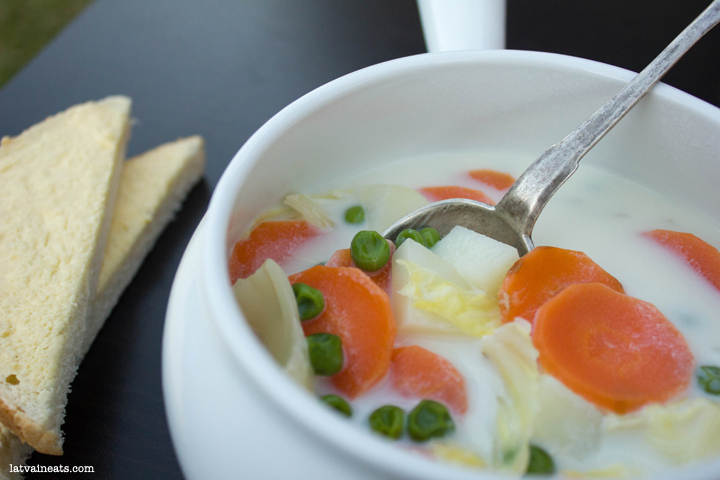 Every spring, as soon as they appear from the ground, plants are plucked and cooked in soup or added to salads and smoothies for an extra boost of vitamins and minerals (just like spinach). 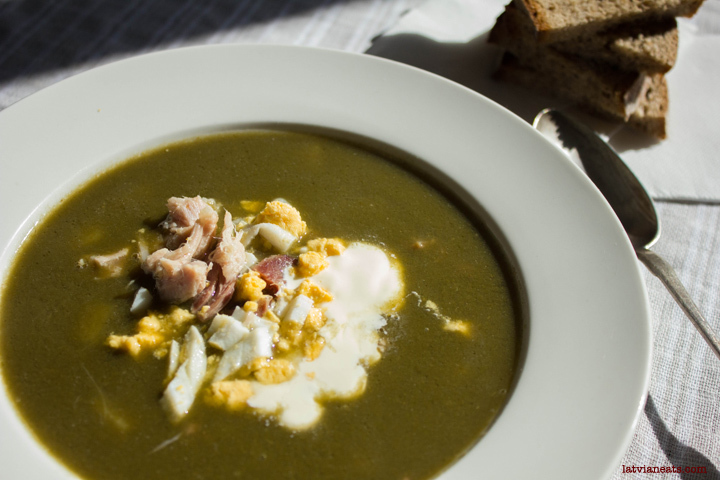 Sorrel soup is my favourite soup – I love the sourness of the sorrel (in Latvian the name “skābene” has originated from a word “skābs”/”sour”) and the way it works together with the smoked meat and eggs. Dash of sour cream and a slice of rye bread and I am in heaven. Unfortunately, my current place of residence considers sorrel a weed and I cannot get my hands on fresh sorrel or seeds due to probably strictest quarantine regulations in the world (despite sorrel being used on shows like Masterchef). Fortunately, Polish share my obsession with sorrel and they import the jarred stuff. It may not be the best quality but beggars can’t be choosers. The recipe comes from my grandma. Most years, at least one batch of soup would include a good deal of fresh nettle that gives the soup milder flavour. 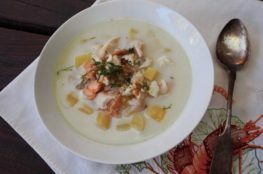 Other popular additions are grated carrots, fried onions, oats or barley (to add thickness); I usually add a handful of rice as barley requires soaking and oats just seem strange in a soup. Place the pork ribs in a large saucepan, cover with water and bring to a boil. Reduce the heat and simmer for an hour. Skim all foam that may surface. Meanwhile, peel the potatoes and cut them in 1cm cubes. If using fresh sorrel, finely slice the sorrel leaves. Finely chop the eggs. Remove the pork ribs from the saucepan. Add the potatoes to the saucepan, bring to a boil, reduce the heat and simmer until potatoes are nearly ready (8-10 minutes). While potatoes are boiling, remove the meat from the ribs and chop finely. Add the meat and sorrel to the saucepan and simmer for 4-5 minutes. Season well. Remove the saucepan from the heat, stir through chopped egg. 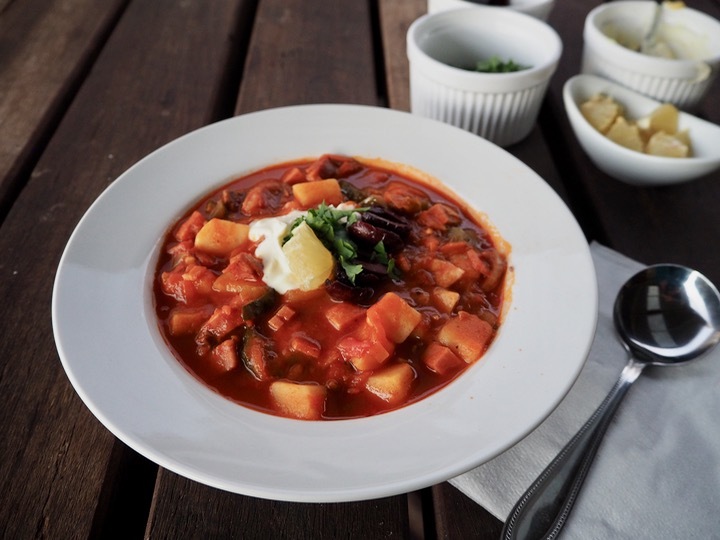 Serve hot with a dollop of sour cream. Pork ribs can be replaced with ham hock. If using sorrel from a jar, chop the sorrel with a blender before adding to the soup ( I have found that the jarred sorrel has quite a lot of strings in it and is not chopped finely enough). We use fresh sorrel, and beef stock. 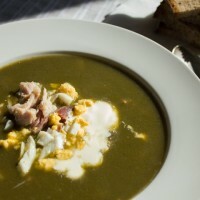 One of my favourite soups, but unfortunately, I make it rarely as sorrel is hard to source here in South Australia (I use spinach and lemon juice if I’m desperate). I have seen lots of variations too – including one with rice and another lady makes it with barley. Some people don’t add sour cream………..nuts…….